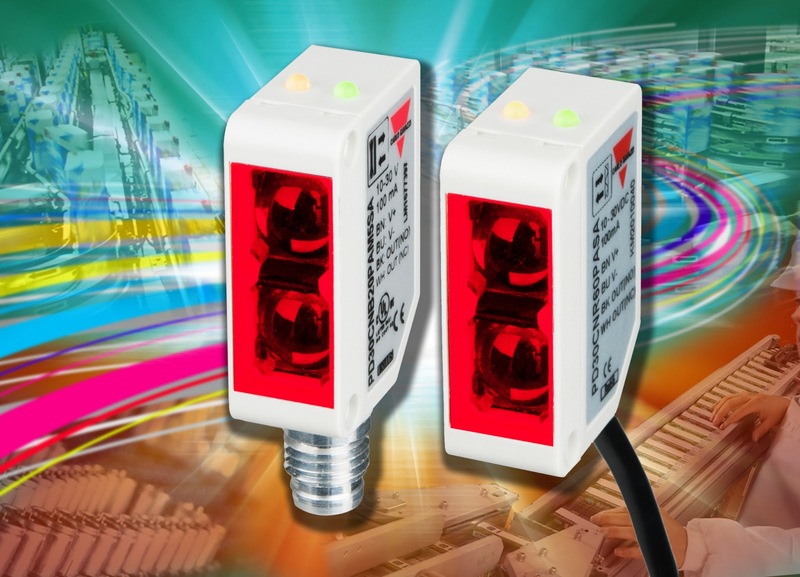 Carlo Gavazzi has launched the PD30CN family of miniature photoelectric sensors which complements its already established range. This new cost effective solution is suited to applications where high accuracy of detection is critical. The PD30CN is not short on features; and includes the latest technology in background suppression which improves accuracy of the detection of colours and has a sensing range of 200mm, diffuse reflective, retro-reflective, with or without polarisation and through beam sensors which are used to detect objects either by reflection or interruption of the emitted light beam. The background suppression model uses active pixel sensor’s (APS) CMOS array of 64 x 1 sensor with each pixel representing a specific position. When the reflected light hits the AOS at exactly the same position and the centre mass can be found of the energy in the received light. This is why white, grey and black objects are detected at similar distances, therefore no need for any re-adjustments; the biggest advantage of a CMOS sensor is that it is immune to the blooming effect where a light source has overloaded the sensitivity of the sensor, causing the sensor to bleed the light source onto other pixels. Its standard IP67 housing is only 10.8x20x30mm and is manufactured in a reinforced PMMA/ABS. Including a manual potentiometer for easy setup and easy adjustment, NO and NC outputs and NPN and PNP versions and has a rated operating voltage of 10-30VDC (incl. 10% ripple), voltage drop of 2 VDC at a maximum load, and an output current of 100mA. The PD30CN meets the requirements of many industries such as Automation and Materials Handling.